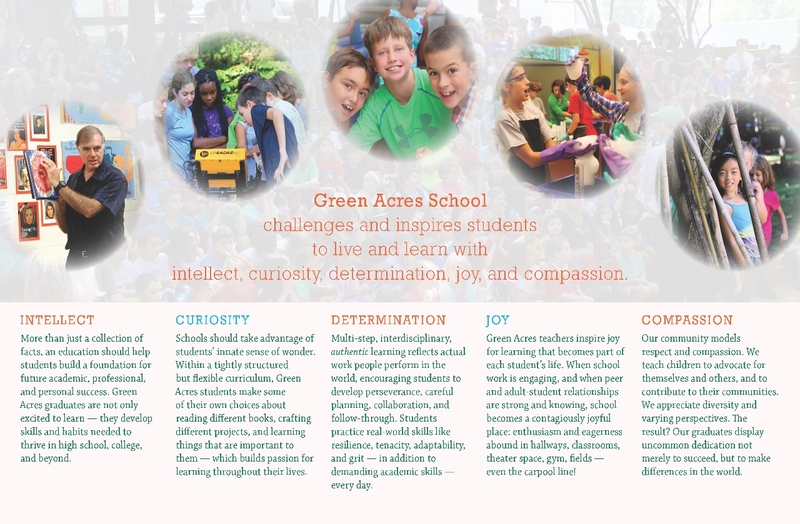 Green Acres School challenges and inspires students to live and learn with intellect, curiosity, determination, joy, and compassion. Green Acres School has embraced the principles of progressive education since 1934. Our program nurtures children’s development, encourages respect for others, and fosters students’ ability to observe, question, evaluate, and make decisions. At Green Acres School, our values address the world’s abiding need for compassion, community, responsibility, and independent thought. We celebrate both individuality and diversity, cultivating understanding of various backgrounds and viewpoints. Our campus design and generous time outdoors engage students with the environment, reflecting our respect for the natural world. At Green Acres School, teaching addresses children’s development and responds to individual strengths, interests, and learning styles. Teachers design curriculum that motivates students to explore ideas and materials, take risks, think independently, and build their own knowledge. A variety of approaches to assessment, including observation by skilled and experienced teachers, allows evaluation of student progress from multiple perspectives. At Green Acres School, learning nurtures not only cognitive development, but social, emotional, physical, and creative growth as well. Learning is purposeful, engaging students in analysis, communication, and collaboration. Our students thrive in an atmosphere of academic challenge, in which they solve problems, become informed and involved citizens, and act for the greater good. Green Acres students are characterized by resilience, self-reliance, social aptitude, and a love of learning for its own sake. At Green Acres School, our organizational structure serves as a model for the democratic principles of our community. Staff, parents, guardians, and trustees are voting members of the School, which is a nonprofit corporation. We involve parents as partners in our students’ education, and invite families to contribute their talents, resources and points of view in support of our mission.